Millions of people across the globe are familiar with Guru Raghavendra or Rayaru as he is more popularly called, his life history, teachings, slokas and granthas and also his final resting place-Mantralaya. The life of Guru Raghavendra is an open book and almost all his years-birth, youth, Grihastaahrama- have been well documented. However, what is not very well known is that Rayaru did spend a lot of time in Karnataka before finally settling down at Bicchale and subsequently entering brindavana in 1671 at Manchale or Mantralaya. After Rayauru was given Sanyasa by Sudhindra Theertharu in 1624, he embarked on a pilgrimage visiting scores of places in South India, including Tirupathi, Trivandrum ()known today as Tiruvananthapuram, Kanyakumari, Kanchi, Rameshwaram, Madurai, Srirangam and other places. In my article, I have decided to concentrate only on Rayaru’s footsteps in Karnataka as it would be a herculean task to write about all the places he visited. Some of the places where Rayaru set foot were Adoni or Advani which in those days ws under the control of Adil Shahis of Bijapur, Manvi in Raichur taluk, Hampi. Nava Brindavana in Bellary district, Bijapur, Kolhapur and Pandrapur bordering Bijapur district and also a part of the Adil Shahi kingdom, (Shivaji was just then establishing the Maratha empire and he was in continuous conflict with the Adil Shahis and Mughals.) 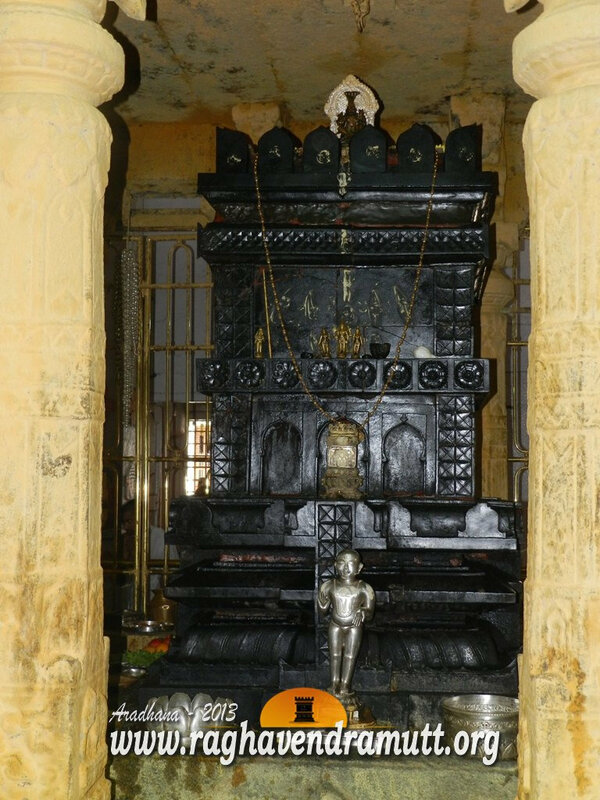 Bijapur , Kittur in Belgaum , Udupi and Kukke Subramanya in Kanara district, Nanjangud and Srirangapatna both near Mysore , , Chitradurga, Gadag and Hubbali. Rayaru visited Srirangapatna, which was then under the control of Wodeyars, and had darshana of Lord Ranganathaswamy. He also visited Bidarahalli where he met and interacted with Srinivasacharya, a well-known scholar. Rayaru was so impressed by Srinivasacharya’s writings that he named him Srinivasa Theertha. Rayaru then decided to have darshan of Vittala in Pandrapur and of Mahalakshmi in Kolhapur. He came to Bijapur which was then under the control of Adil Shahis. During his halt at the Krishna river he wrote Bhavadipa and a commentary on Anu bhashya, called Tattva Manjari. He came to Malkhed in Gulbarga district and visisted the shrine of Jayatheertha (Teekachar) and his Guru Akshobya Theertha (who was one of the fpour direct disciples of Madhwacharya-the other three being Padmanabha Theertha, Narahari Theertha and Madhwa Theertha in that order). Bjapur, even in those days, was known for its extreme climate. The summers can be really torrid. When Rayaru was in Bijapur, summer had already set in and the scorching heat was sapping the energy of many. A Brahmin, overcome by heat stroke, swooned and he was asking for water. Rayaru, who saw him, recited a sloka and Rayaru’s followers and onlookers were stunned to see water spring up from the earth and quench the Brahmin’s thirst. Once, Rayaru was on his way to Bijapur with a large group of people after visiting Pandrapur-the home of Vittala. One of the members of the group was Dasappa. Dasappa was accompanied by his pregnant wife. The scorching sun made Dasappa’s wife miserable. There was no water available and no shelter for her to take rest. Dasappa’s wife developed labour pains. When Rayaru was apprised of the situation, he threw a Shelya (clothe worn by men to cover their chest) in the air. The clothe shaded Dasappa’s wife from the hot sun and also gave her shelter and privacy. Rayaru then threw a twig near the tent and water came gushing out. Dasappa’s wife gave birth to a boy who was named Ramappa. Rayaur also visited Vishnumangala, where Trivikrama Panditacharya, an erstwhile Advaitha scholar, had debated with Madhvacharya for fifteen days, before accpeting defeat and becoming his discpile. Rayaru then visisted the temples at Subrahmanya and Udupi. On seeing the idol of Krihsna in Udupi, he sang Indu yenage Govinda. Udupi is also the place where Rayaru gave discourses on Sarvamula Grantha and wrote Chandrika Prakasha, a gloss for Tattparya Chandrika written by Vyasa Theertha. He is also believed to have written in Udupi Tantradipika, a book on Sutras, and Nyayamukthavali for the benefit of students. During his Bijapur visit, Rayaru cured Venkanna, a mentally ill person, and also got him married.